Amidst the ongoing controversy over water cut-offs in Detroit, a Canadian group is going ahead with plans to bring 1,000 litres of water to the city on July 24. 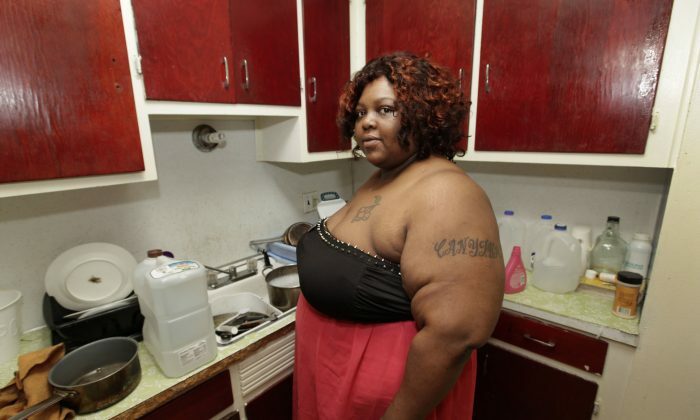 Floundering in the grip of bankruptcy, Detroit has been shutting off water to thousands of residents per week who are in arrears on their water bills. Some 30,000 households are expected to be disconnected from water services over the next few months. In addition, collection efforts have been intensified and water rates increased recently in response to delinquent debt from previous years. This has sparked the ire of the Council of Canadians, which calls the cut-offs a “blatant violation of the human right to water and sanitation,” and has vowed to help the residents who have been left without water. “In a region that holds 20 percent of the world’s freshwater, the water cut-offs are a source of growing international outrage,” said Maude Barlow, chair of the Council of Canadians. Barlow will be part of a convoy bringing the water shipment across the border to Detroit on July 24. She is also planning to appeal to the White House. “We’re urging President Obama to step in and stop the cut-offs,” she said. About 90,000 active customers in Detroit are delinquent on their bills, adding up to about $90 million, according to the Detroit Water and Sewerage Department (DWSD). The department recently launched an assistance program, allocating $1 million to help customers who can’t pay their bills. “Our goal is to have as few shutoffs as possible,” said DWSD director Sue McCormick in a press release. She noted that about 60 percent of the homes that have been cut off had their water restored within 48 hours after arranging a payment plan or finding alternative means. The Detroit Water Brigade, a non-profit group established to address the water crisis, has called on the city to immediately end the shutoffs, saying the action is inhumane and puts the Detroit’s most vulnerable at risk. “The human and social cost of this overreaching, aggressive, and often uncivil process—in the face of overwhelming unemployment and abject poverty—creates the potential for disease and medical injury,” said a July 9 open letter from Water Brigade activists. The Detroit People’s Water Board has also criticized the DWSD for going after residential accounts while allowing delinquent commercial clients to remain in service. Barlow informed the United Nations about the issue, and it, too, has condemned the cut-offs. Disconnection of water services because of failure to pay due to lack of means constitutes a violation of human rights, said Catarina de Albuquerque, the U.N. expert on the human right to water and sanitation. Leilani Farha, the expert on the right to adequate housing, expressed concern that children are being removed by social services from their families and homes because, without access to water, their housing is no longer considered adequate. Detroit filed for bankruptcy last year—the largest US city ever to do so—as a result of $18 billion in long-term debt and significant revenue declines. Detroit’s heyday of the 1950s and ’60s is long gone. In recent decades, the city has suffered from a mass exodus of residents and worsening rates of unemployment, poverty, crime, and plummeting per capita incomes and property values. With few tax dollars coming in, services have suffered extensively. Detroit’s water department, which is responsible for about $6 billion of the city’s $18 billion in debt, is one of the major issues in the bankruptcy.